Curtis Granderson: Siren Call or Smart Pick? 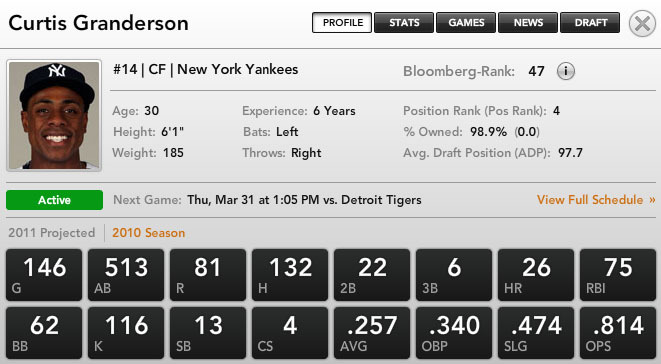 According to the Bloomberg Sports Front Office tool, Curtis Granderson is the fourth-best center fielder and ranks at about 47th overall – and yet his ADP is hovering around triple-digits. Seems like a moment rife for opportunity. Except there’s the recent news about his health. And his ongoing platoon issues. Let’s take a look at these and see if they threaten to completely reduce his value to rubble. First, it’s true that Granderson is not a great batter against lefties. His .215/.275/.347 line against lefties is much worse than his .287/.363/.528 line against righties. And that lacking lefty line has come in 859 plate appearances, so it’s somewhat reliable. He’s not great against lefties. The thing is, he still takes at-bats against them. It only seems like he’s a platoon outfielder. Take a look at the chart below, and you’ll see that he actually took more at-bats against lefties than the average player last year. The Yankees know that, with his glove, he’s still valuable. And fantasy fans should know that he still hits 3-5 home runs a year against lefties, and, as the chart shows, isn’t sitting versus them. If you’ve got a good fourth outfielder in your daily-lineup fantasy league, fine, put him in instead of Granderson versus a lefty. But don’t discount Granderson too far for having a slight flaw. Now Granderson is hurting from an oblique strain, but during the last spring training game, manager Joe Girardi said that his center fielder said that he would have played if it was the season. There’s still a week left before the season opens, but obliques are tricky. It’s hard to know exactly how much time, if any, Granderson will miss, and watching the news wire in the next couple days will hopefully help. The injury news, along with his struggles against lefties, will surely depress Granderson further than his current ADP. On Yahoo, Delmon Young‘s ADP is 101.1, Nick Markakis‘ is 111.6, and Granderson’s is 112.5. I’d take the chance at power and speed over those two outfielders, even if the batting average is not always there. On ESPN, Granderson’s ADP is higher (87.7), and he might not be a good option over a healthy Corey Hart (93.4), but I’d certainly take him over Torii Hunter (116.4) and Juan Pierre (115.6), more one-dimensional players at this point in their careers. Curtis Granderson is not perfect. But at some point, he’s a value. In mixed leagues, start looking at him once you approach double-digit rounds.